Fixed rig setups are nothing new to the production industry. Scores of remote head cameras are installed in everything from hospitals to schools to capture fly-on-the-wall footage of the stories that unfold in these environments. 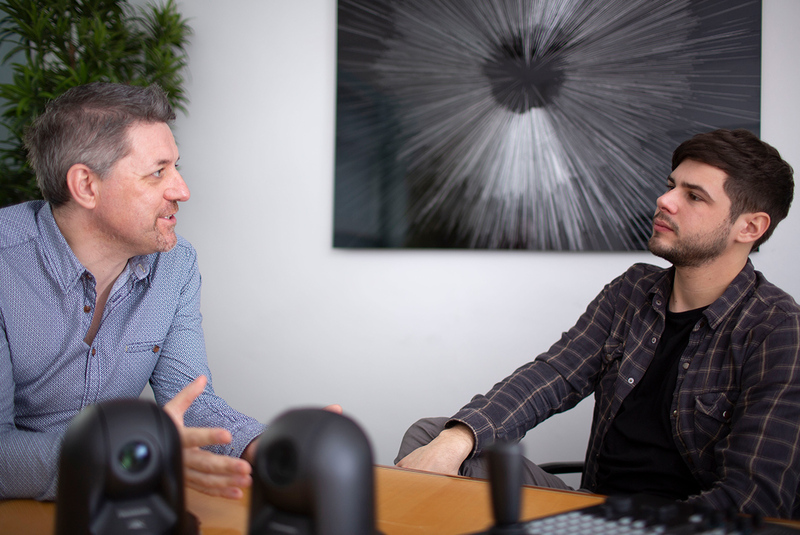 We caught up with Anna Valley director and broadcast camera expert, Shaun Wilton and Project Engineer, Alex Osborn to find out more. What is a mini fixed rig? 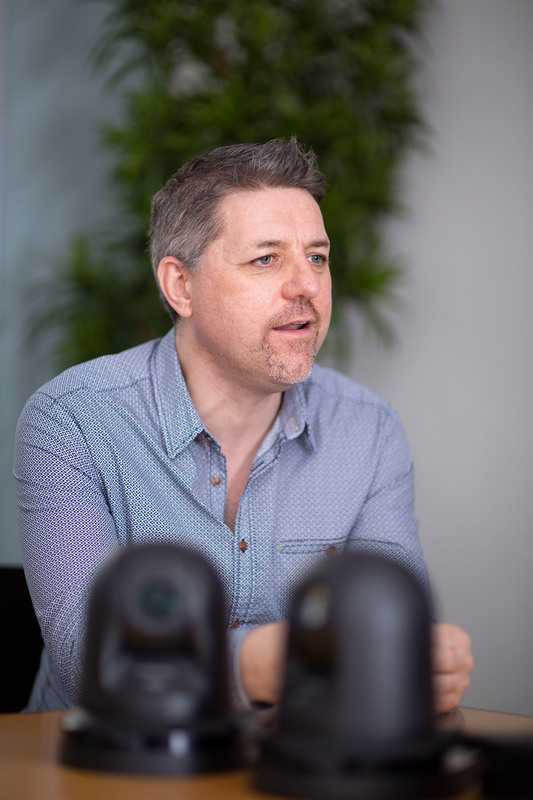 Shaun: Most of us are familiar with the big fixed rig productions like Big Brother and 24 Hours in A&E – made possible by advances in camera technology which allow producers to separate the camera positioning from camera control. The appeal of these shows is the feeling of being a fly-on-the-wall – observing situations that were previously impossible to shoot with a normal camera crew – either because it’s difficult or dangerous to put personnel into these areas or because it would be prohibitively expensive. The majority of these established fixed rig shows have a really long duration and shoot day after day over a long period of time. But sometimes, even though you need to separate the camera from the crew, it isn’t appropriate to have cameras, lights and audio rigged in a location for a long period of time – the timescale of the production is a lot shorter and you need a more flexible approach. That’s where the mini rig comes into play. 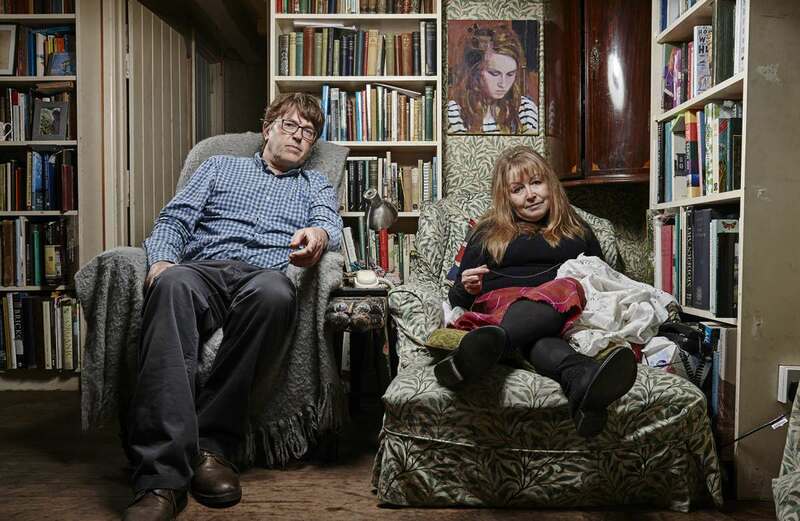 The approach was born out of the brief we had for Gogglebox. Studio Lambert called upon our technical expertise as a trusted supplier for many years at that point. They had lots of locations, needed to have a very small footprint (in terms of the space that the cameras and crew took up) and needed to move in and out of locations quickly. It was a difficult brief to deliver on, but we drew on our broad technical knowledge to refine systems down to the essential components for speed and weight. We conceived and designed mini rigs that can go into and out of locations quickly but still separate camera positioning from the operation side of the rig. 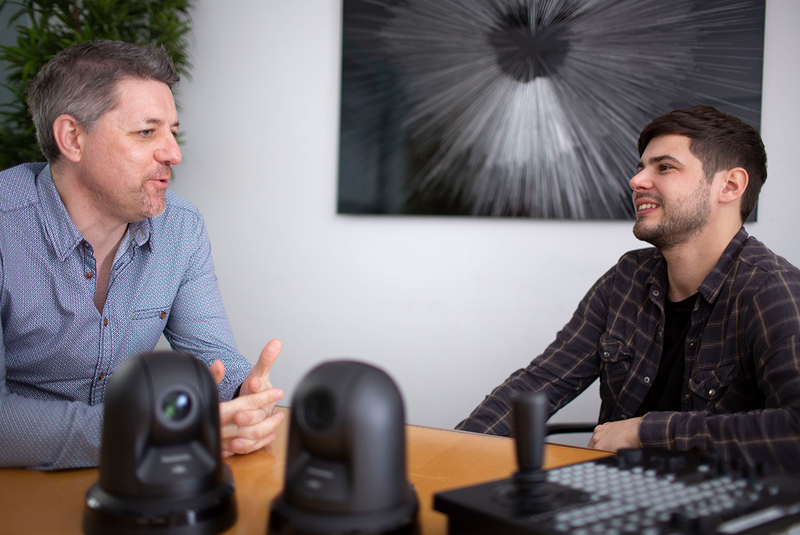 Alex: While it may have been born out of necessity, there are also benefits of shooting in this way – for example, not having operators in the space means that you don’t have to worry about shooting other cameras in the room and the “fixed rig” look is now appealing in its own right. What kind of show or content is best suited to this approach? Shaun: Shows with a short or limited amount of time – where you don’t have the time to do big installations like you might do for a long-term fixed rig – are ideally suited to the mini fixed rig. If you’re shooting in places where you can’t affect or disturb the venue too much (like if you’re going into people’s homes where you can’t just start drilling into the walls) and shows that have limited space. We’ve worked really hard to bring our equipment footprint down to a minimum. Alex: For example, for our Gogglebox setup, we can fit everything on a 6-foot trestle table – which can fit into just about any room in any house – and we leave the venue exactly the same as it was when we arrived. A mini fixed rig can work in almost any location, but a full-blown fixed rig only works in locations of a certain scale. Shaun: Yes, mini rigs are completely scalable and can go from two cameras up to fifteen or twenty cameras. I would still class a ten or fifteen camera rig as a mini rig because it’s still a lot smaller than the ninety-plus camera setups that a lot of fixed rig shows rely on. Even with a ninety camera rig you still only record some of those cameras at any one time. The production team chooses which zone has the most relevant or exciting action going on in it and then records streams from that area usually with about four cameras. With a mini rig we would cover fewer different zones that we concentrate on. Can you tell us about some of the shows that you’ve worked on where the mini fixed rig approach has been particularly successful? Alex: With Gogglebox we’ve got a number of different families to shoot – each at a different location, and we will sometimes visit the same family twice within the same week – so that we leave enough time between shoots for new shows and news stories. Shaun: It would be a huge expense if you had to rig each family’s house with permanent kit, replicated in every house, only to be used on 2 days over a week’s period. They’ve also recently doubled the number of families featured in the show – which made almost no difference to the cost of shooting with a mini rig but would have had a massive impact on a fixed rig budget. The documentary, Life Behind Bars: Visiting Hour produced by Chalkboard TV for Channel 4 has some similarities to a big hospital rig show like 24hrs in A&E but, because of the nature of the institution, they wanted us to have as little impact as possible. The shoot for this programme was also concentrated in one zone – the visiting room – which meant we didn’t need as big a setup. But even if the prison had said “Yes you can drill into our walls,” there’s a very small number of authorised companies that can do things like drilling into a prison’s walls. I think there was one contractor that was cleared to have access to blueprints showing power lines and prison layouts because of security. 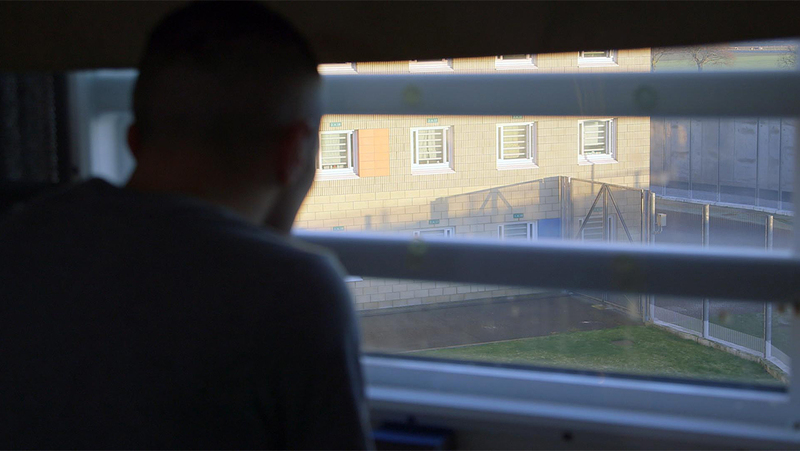 Alex: In a prison every room has a purpose and there are no “dead spaces” or spare rooms, and even if you had the space and could position six cameras and cameramen in the waiting room, it just wouldn’t be possible from a security perspective. Shaun: Yes, there’s a good reason to separate the technology from the operation in a prison, because of the constant underlying risk of violence. 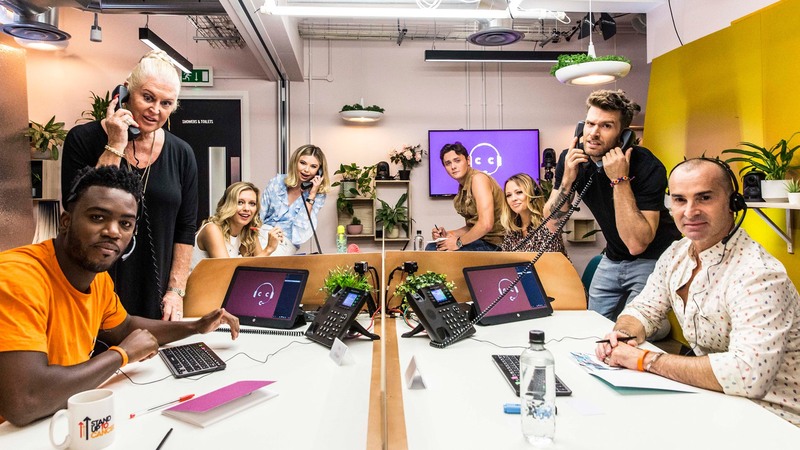 Alex: Celebrity Call Centre was set up in a trendy London office block which was dressed up to create a bespoke call centre. Obviously, the celebs were aware of the fact that they were being filmed and the producers could have chosen a location that could accommodate camera crews, but part of the reason for choosing a mini fixed rig approach for this programme was because the aesthetic is appealing and has become a recognised look for this kind of show. Shaun: And, when you’re shooting from multiple angles and you don’t want to see camera operators in shot, then fixed or mini fixed rigs can be a good option. If you think about studio multicam shoots – the cameras are all in a line and they’re all pointing in one direction at a set or a stage – whereas with this type of show you’ve got multiple things happening in all directions and, no matter what way you configure the cameras, there’s still a chance that you’ll see a cameraman standing there. Alex: Exactly, in this instance there were four desks facing each other so that the celebrities could interact while they took calls. If you had to try cover that with traditional cameras you would have had crew in the shot at some point. It also would have taken a much bigger crew to shoot this show with manned cameras. Do you use the same camera technology on a mini fixed rig as they would use on a bigger fixed rig production? 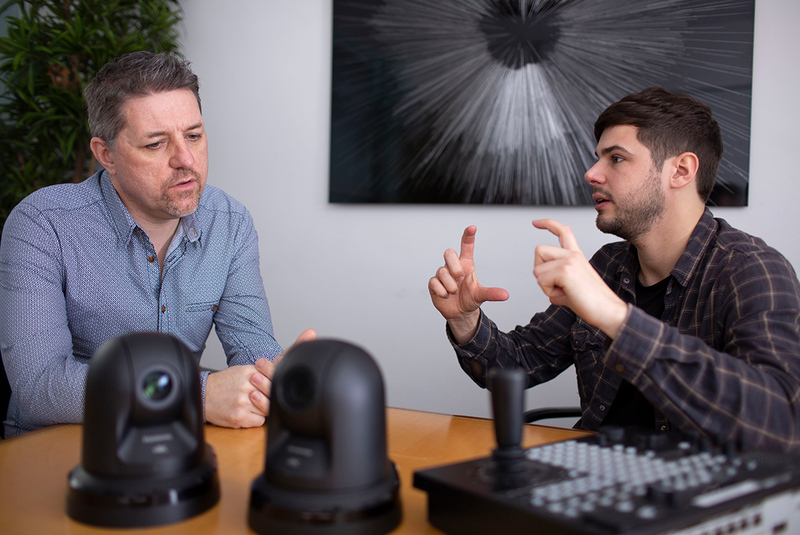 Alex: Yes, the remote head cameras we use on a mini rig are the same as the ones you’d use on a large-scale fixed rig production. Our most popular professional cameras are the Sony BRCH900 and the Panasonic AW-UE70. Shaun: Like any camera gear, there are pros and cons to using different cameras for mini fixed rig shoots. The Sony BRCH900 is twice the size of the Panasonic AW-UE70 and has a higher rate card rate – but the look is so superior that you almost forget that it’s a fixed rig camera. Alex: Coming into a room like an office and trying to make that look nice with only natural lighting, you rely heavily on the cameras. Using cameras that are more sensitive in low light can help make less “dressed” locations look better. Shaun: Zoom capability is often an important factor. For example, in the prison, there was quite a lot of concern about how far the camera had to be positioned away from the table, but with the longer zoom they could still get the close ups they needed for the emotional scenes. Shaun: It can be more affordable for mini fixed rigs to use higher spec cameras, simply because they don’t need as many units. A small price difference between cameras quickly becomes very expensive for fixed rig productions that need ninety cameras, but it’s easier to absorb the extra costs in your budget if you’re only using fifteen cameras. We’re often asked to provide PSC camera kits as well for interviews or back stories or contributed content that is outside of the rig. We advise that producers try to keep the various cameras within the same camera family if you’re mixing fixed rig and PSC footage within a programme, so if you really like the Sony FS7 as a PSC camera then there’s a good reason to use Sony remote heads. If you can’t, then it’s accepted that there will be a different look between the fixed rig and PSC camera because the different manufacturers have different approaches towards highlights, lowlights, skin tones and things that contribute towards a different look – sometimes you might do that intentionally to create contrast. It’s not unique to a mini fixed rig setup but it is a consideration when we’re choosing or specifying the technology. How does the gallery setup differ for mini vs fixed rig shoots? Shaun: It’s certainly about the size factor. For a mini rig we’re approaching each brief with the need to reduce the footprint of the kit as much as possible, whereas for a traditional fixed rig they’ll just bring in portacabins and take over the whole car park. For mini rigs the big question is often “Where will the gallery go?” which is why a recce is essential. It’s about people footprint as well – we can reduce down the technology and the kit to make it as small as possible, but the number of people dictate the amount of space you need more than the tech does, actually. Alex: With the amount of space it takes me to setup my laptop I can control 100 cameras but then there’s a director next to you, sound with their rack, execs, loggers – you need a full office of people to run the show and make it work – it’s not just the technology that makes the show. You need to think carefully about who needs to see and hear what and then plan the gallery footprint around that. Are mini fixed rigs an affordable approach? Shaun: Just because it’s a mini fixed rig, doesn’t mean that it’s low-budget – it’s a very different price point to a PSC approach. If production teams are doing a mini rig for the first time, there’s quite a bit to learn up front – the amount of rig and time involved does surprise some and is often underestimated and underbudgeted. Anyone who is thinking of shooting with a mini fixed rig should call us at budgeting stage, because even though one of the main reasons to do a mini fixed rig is speed, that doesn’t mean that they need less lead time than a traditional fixed rig. 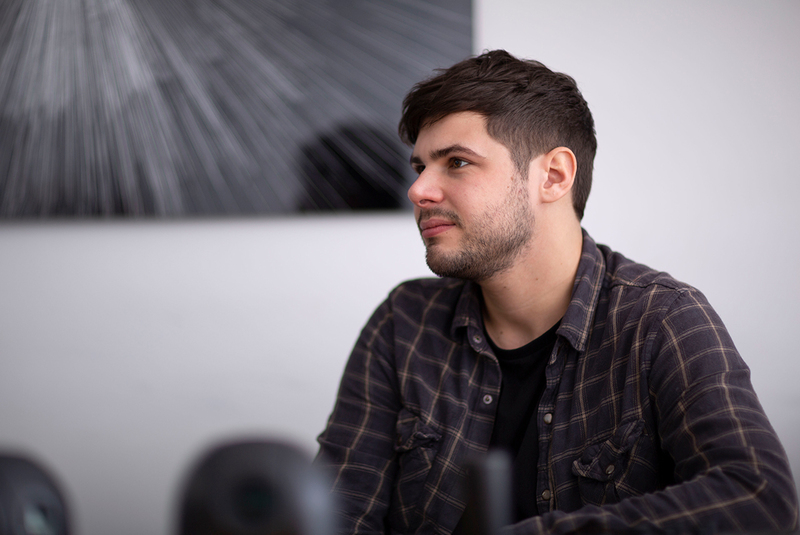 Alex: Exactly, the reason why we can rig, shoot and derig in a short space of time is because we’ve done all the planning ahead of time and everyone knows exactly where things are going when they arrive on location. What are the possible applications for the mini fixed rig beyond broadcast programming – what other ways are these setups being used? Shaun: Mini fixed rig setups are used effectively for a lot of live events, they can help big companies with internal comms where you may not have the space or time to travel to different venues and they’re also effective for filming research or focus groups where you want the cameras to be inconspicuous. Alex: If there’s a lot of different action that needs to be covered, but limited resource or crew – mini fixed rigs provide good coverage with fewer people. Shaun: They’re also ideal for any environment where there’s danger or risk – I can imagine that if the military were doing training or testing where they needed to fire weapons or set off devices, mini fixed rigs could help cover that without putting anyone at risk. Remote head cameras can also supplement multicam setups at big live performance events – using remote cameras to cover stage shots means that you don’t have camera crews on the stage getting in the way of the performance. Get in touch to discuss using a mini fixed rig for your next project.